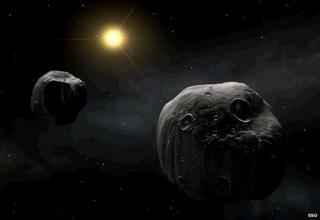 Image caption About 15% of near-Earth asteroids are binaries. We've all seen the films where an asteroid hurtles towards our planet, threatening civilisation. What's less well known is that menacing space rocks sometimes come in twos. Researchers have outlined some of the best evidence yet for a double space impact, where an asteroid and its moon apparently struck Earth in tandem. Using tiny, plankton-like fossils, they established that neighbouring craters in Sweden are the same age - 458 million years old. Binary asteroids are thought to form when a so-called "rubble pile" asteroid begins to spin so fast under the influence of sunlight that loose rock is thrown out from the object's equator to form a small moon. Telescope observations suggest that about 15% of near-Earth asteroids are binaries, but the percentage of impact craters on Earth is likely to be smaller. Only a fraction of the binaries that strike the Earth will have the necessary separation between the asteroid and its moon to produce separate craters (those that are very close together will carve out overlapping structures). Calculations suggest around 3% of impact craters on Earth should be doublets - a figure that agrees with the number of candidates already identified by researchers. The unusual geological characteristics of both Lockne and Malingen have been recognised since the first half of the 20th Century. But it took until the mid-1990s for Lockne to be formalised as a terrestrial impact crater. In the last few years, Dr Ormo has drilled about 145m down into the Malingen structure, through the sediment that fills it, down to crushed rocks known as breccias and deeper, reaching the intact basement rock. Lab analysis of the breccias revealed the presence of shocked quartz, a form of the quartz mineral that is created under intense pressures and is associated with asteroid strikes. This area was covered by a shallow sea at the time of the Lockne impact, so marine sediments would have begun to fill in any impact craters immediately after they were created. Dr Ormo's team set out to date the Malingen structure using tiny fossilised sea creatures called chitinozoans, which are found in sedimentary rocks at the site. Their method, known as biostratigraphy, allows geologists to assign relative ages to rocks based on the types of fossil creatures found within them. The results revealed the Malingen structure to be the same age as Lockne - about 458 million years old. This seems to confirm that the area was rocked by a double asteroid strike during the Ordovician Period. Dr Gareth Collins, who studies impact cratering at Imperial College London, and was not involved with the research, told BBC News: "Short of witnessing the impacts, it is impossible to prove that two closely separated craters were formed simultaneously. "But the evidence in this case is very compelling. Their proximity in space and consistent age estimates makes a binary-impact cause likely." Simulations suggest the asteroid that created Lockne was some 600m in diameter, while the one that carved out Malingen was about 250m. These measurements are somewhat larger than might be suggested by their craters because of the mechanics of impacts into marine environments. Dr Ormo added that Malingen and Lockne were just the right distance apart to have been created by a binary. As mentioned, if two space rocks are too close, their craters will overlap. But to qualify as a doublet, the craters can't be too far apart, because they will exceed the maximum distance at which an asteroid and its moon can stay bound by gravitational forces. "The Lockne impactor was big enough to generate what's known as an atmospheric blow-out, where you blow away the atmosphere above the impact site," said Dr Ormo. This can cause material from the asteroid strike to spread around the globe, as happened during the huge Chicxulub impact thought to have killed off the dinosaurs 66 million years ago. The Ordovician event wasn't powerful enough for that material to be traced, as it would have been very dilute in the atmosphere. But the impact would have had regional effects; for example, any sea creatures unlucky enough to be swimming nearby would have been instantly vaporised. Other candidate double impact craters include Clearwater East and West in Quebec, Canada; Kamensk and Gusev in southern Russia; and Ries and Stenheim in southern Germany.